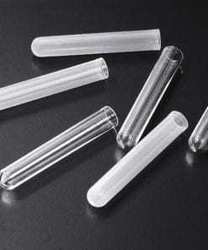 we are leading manufacturer of plastic test tube . with polyproplelene and poly styrene material . Ria Vials are polypropylene /polystyrene tubes generally used in Radioimmuno Assay–a scientific method used to test antigens (for sample, hormone levels in the blood) without the need to use a bioassay. We are manufacturers, traders and exporters of Disposable and Autoclave Test Tubes in Various Sizes. Polystyrene and Polypropylene with excellent clarity and strength. Dimension: 12 X 75 MM. - Abdos Ria Vials are polylropylene/ polystyrene tubes generally used in Radioimmuno Assay–a scientific method used to test antigens (for sample, hormone levels in the blood) without the need to use a bioassay.